Samsung Electronics plans to unveil the latest in its Galaxy line, the S4, at a European technology exhibition in February, according to company officials and local parts suppliers for the technology giant. ``Samsung is ready to unveil the next Galaxy smartphone _ the Galaxy S4 _ at early next year’s mobile world congress (MWC) in the Spanish city of Barcelona,’’ said an official . The new device is expected to hit globally in March at the latest. MWC is the biggest exhibition in the world for telecom companies and Samsung, will be exhibiting the new Galaxy at its booth. It is expected to be the firm’s most powerful handset yet in terms of hardware specifications and software advancement, will help the Suwon-based outfit further cement its leadership in the global smartphone market. In Europe, Samsung is gaining a bigger share of the smartphone market. A recent ruling in the U.K. said Samsung didn’t infringe on Apple’s design patents. Executives from Samsung’s local parts suppliers said the company’s new flagship smartphone will ``definitely use’’ LTE networks. It will also sport its in-house Exynos-branded application processors and quad-core chips. The S3 is using both Samsung’s Exynos and Qualcomm’s Snapdragon processors depending on the country. The screen size of the S4 is expected to reach 5-inch from the the current 4.8 screen size of the S3, while it will use Google’s Android software and sport an OLED display, said the officials.But Samsung has yet to decide whether it will use flexible display technology for the upcoming Galaxy due to production problems encountered by Samsung Display. Samsung Display officials declined to comment on the new Samsung smartphone project. 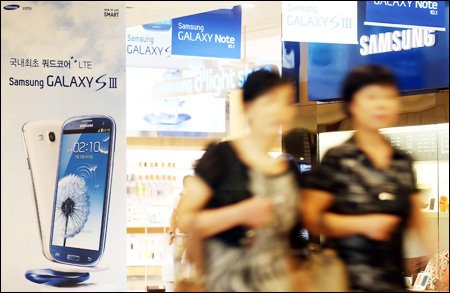 ``Samsung wants to keep its one-year product schedule and the Galaxy S4 will be the first to match that strategy. The S4 will see some external changes but retain its popular rectangular shape with rounded corner concept,’’ said an official from one of Samsung’s local partners. Samsung is currently in talks with major American carriers to apply modified phone designs. Market analysts and experts view the S4 as a ``clear message’’ to Apple. ``Samsung’s edges in manufacturing will further shine after the patent disputes go further on. In markets, Samsung is confident to widen its lead over Apple, though the legal fight is a totally separate issue,’’ said an industry executive who is familiar with the matter. Samsung expects sales of the S3 to pass 30 million by the end of the year. It has already sold 20 million in just over three months. The S4 will help Samsung take on Apple in the United States, according to officials. Market research firm IDC shows Samsung has a 30 percent share, globally, while Apple has 16 percent. But NPD’s recent data shows Apple controls 31 percent of the U.S. smartphone market, followed by Samsung on 24 percent. The S4 plans come amid escalating patent disputes between the two technology giants in 50 different cases on four continents. Apple won a victory last month after a United States jury found the Korean firm copied key features of the iPhone and awarded Apple $1.05 billion in damages. Hi Michelle , thanx for dropping by . It is indeed good news for me too and waiting for this product to come . Wow. Come on guys. Let's be realistic. Do you remember how long ago the S3 was announced before it launched. You think this is gonna launch in the next couple months? HAHA. Could be ! let's wait a bit because this time Samsung have to come out as a winner .